We challenge you to cut 50 lawns FREE for the elderly, disabled, single mothers, and the veterans in your town. 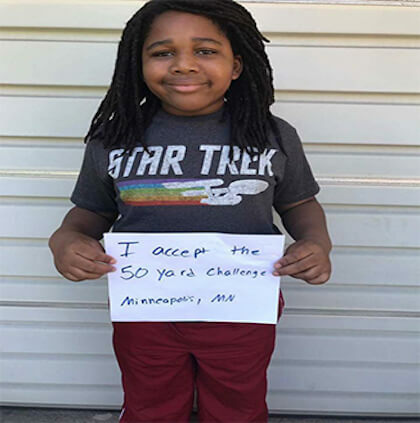 If you accept this challenge, all you need to do is send us a photo of you holding a sign saying “I accept the 50 Yard Challenge”, and in return, we’ll send you your white RMLCS shirt along with shades & ear protection to get you started. For every 10 lawns cut, you will get a new color shirt. • 50 lawns earn a black shirt. • Every time you mow 10 lawns, you will receive a new shirt, highlighting your experience and commitment to helping others. F.A.Q: Your child may do a lawn more than once, they may also team up. Below is an example of how your child can make their sign. Feel free to be creative with the sign.